Rwanda's fish output increased in 2018 on account of increased investments in modern and commercially oriented aquaculture practices. In 2016, the country produced just 26,581 tonnes of fish before increasing to 31,465 and 43,632 tonnes in 2017 and 208 respectively. 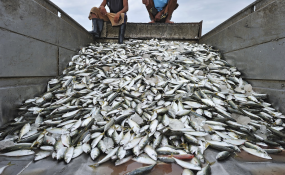 The outlook demonstrates that strategies to increase the country's fish stocks as it seeks to trim imports and tackle malnutrition are paying off. "The main challenge that farmers are exposed to is lack of funding to make their ponds more productive," the minister said, adding that government was exploring various funding options for fish farming. "Protecting lakes from fish poachers who use illegal snares should be a priority," he said.